Charlie (3 1/2) watched Laura and James pull out of the driveway and head to a family wedding last Friday the 27th. Mary and I stayed and played with Charlie. He didn’t cry. Penny watched by his side. I’ve posted similar pictures of the same scene. You wonder what’s going through his mind. A little wave. What would your word be for this image today? happening at the same time- simultaneously. *2018 Tim’s poem came to mind as I navigated the numerous sidewalks on my walk to Book Club on Sheridan Avenue tonight. clear the path will never find the Way. can scarcely be regarded as human. Timons Esaias is a writer and poet living in Pittsburgh. His short stories, ranging from literary to genre, have been published in fourteen languages. He has had over a hundred poems in print, including Spanish, Swedish and Chinese translations, in such markets as 5AM, Bathtub Gin, Main Street Rag, Willard & Maple, Elysian Fields Quarterly: The Literary Journal of Baseball and many others. He has also been a finalist for the British Science Fiction Award, and won the Asimov’s Readers Award. His poetry chapbook, The Influence of Pigeons on Architecture, sold out two editions. He is Adjunct Faculty at Seton Hill University, in the Writing Popular Fiction M.F.A. Program. This poem was originally published in hotmetalpoets.com when it existed. This entry was posted on February 19, 2010. It was filed under poetry, Things in the Snow and was tagged with city scene, HIghland Park, photo of the day, photography, Pittsburgh, Poem, poet, poetry, shovel, sidewalk, snow, Timons Esaias, urban scene, winter scene. 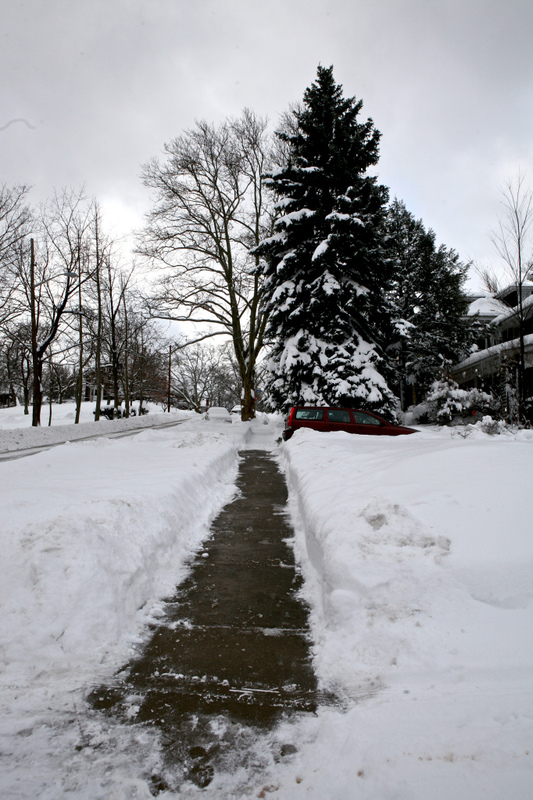 Makes me happy that our sidewalks are clear and clean – thanks to Mike!! I couldn’t handle all those punishments! Seems like an almost normal day today!! Thanks for starting it with something special!!! Did Bill mean the snow was too deep – or the poem??!! Either way, I agree! My mind is mush (like this snow will soon be) — been in the house too long!!! All tis is great Ruth. It is like your photos and words are a diary of living through these snowy days. whose sidewalk’s untouched while his driveway’s clear. I know the snow is a pain, but it is beautiful. I enjoy the pic very much. Makes me feel good about clearing my sidewalk, even though it is pain. Fits the last month or so very well! So funny, and the photo is a perfect pairing Ruth. Stay warm and cozy. Spring is right around the corner! LOVE the poem! Smart, witty, cheeky creativity makes me smile. Wonderful winter / snow photos. A little manipulation goes a long way and I don’t do it often but Jo Bryant of Chronicles of Illusions blog shared the app link to Tiny Planet and I couldn’t resist. The app makes stereographic images of your iphone photos. She said you need to have the right type of photo to begin with and the third photo is one I took the other day. The sun was out in the late afternoon. The sky was blue. I pulled over and took in Lewis Center Ohio. The light so warm on the field. \The first photo is the Tiny Planet option and the second photo is the Rabbit Hole. my friend Kristin from Florida (and steadfast blog follower) texted a dozen photos today that fascinated me. Thought you’d enjoy seeing the Ice Hotel in Quebec City. Hotel de Glace. I’ve never been to an Ice Hotel but I loved the virtual tour via her photos. I asked if your lips stick to the glass made of ice. You lick it first. Brrrrrrr. Although I’m in Ohio, I got to experience a taste of the winter Carnaval Quebec in Quebec City today. What fun! A group effort on the photography, thanks to Kristin and Rick. See their exhilarating toboggan ride video below. Kristin (native Floridian ) framed by the intricate ice sculpture. Join my friends on a fast toboggan run! You might remember the pie pin map at Grant Bar in Millvale when Kristin and Linda visited me.